Learn more about the beauty and inspiration that drives our Runstreet Art Runners in our Art Run Spotlight series. Today's Art Runner Spotlight is on Jose Sanchez. Jose has transformed his life with his strong discipline and self motivation, which led him to begin running and eating healthy. In the process he has lost 50 lbs, met friends from all over the world and has run over 200 races! 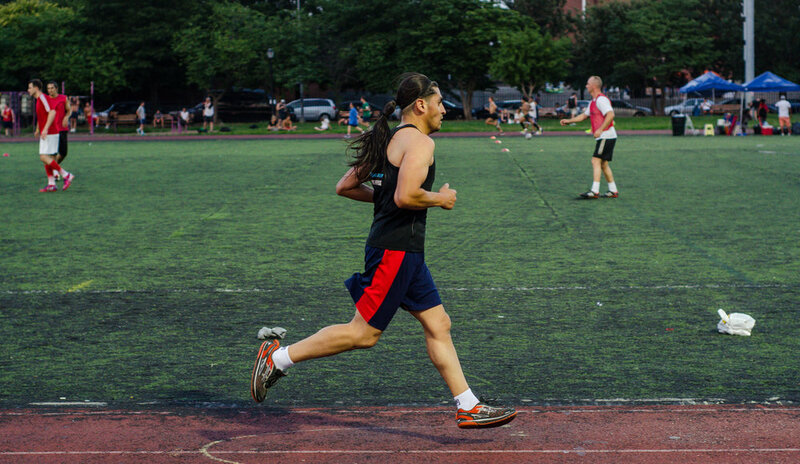 Jose has been a dedicated member of Runstreet since our early days as a Brooklyn running group. His passion for running, amazing discipline and speed, and his easygoing, relaxed nature have made him an inspiring to all of the Wolf Pack. Jose races more than anyone I know, and his tenacity in always getting back up again, no matter the circumstances, is incredible. I started running as a complement activity (besides healthy eating) to lose weight. I lost 50 pounds. I haven't stop since then. How did you find Runstreet? I found Runstreet through social media (Instagram). I like the way we runners get involved in this sport, how we encourage each other to get better everyday. Also, I like the friendly atmosphere in every event with the Wolf Pack (Track Tuesdays, Art Runs, etc...) I like everything about the team. Marnie (our leader) is the most kind, motivated and great person that I know! She is always with a big smile. Without any doubt I couldn't ask to be on a better team than Runstreet! Favorite Race: My favorite without any doubt is the NYC HALF and the Chicago Marathon. Favorite Quote: "if you want to run fast, run alone. If you want to run far, run together." Favorite distance to race: I love the half marathon - 13.1 miles, it's my favorite. My proudest running accomplishment: My first 1st place overall finish at the Atlantic City 5k and finishing my first marathon, NYC Marathon. What keeps me motivated to run: Get better in what I love to do. What is my next big running goal: Without a doubt get a BQ (qualify for the Boston Marathon) That will be the cherry on top of my career as a runner.